Midland began as a railroad town about 1913 with the arrival of rail service via the North Carolina Railroad (NCRR). The town is now incorporated, as of 2000. Prior to Midland's becoming a railroad village, a community named Garmon existed in the area (a few miles to the east) around the Garmon Mill begun by Michael Garmon in the late-1700s, and Garmon appears on an 1864 map of North Carolina. Another community located to the west, Cabarrus Station, also predated Midland as a railroad stop, and has been incorporated into the town of Midland. Formerly, the economy of Midland was essentially agricultural with some textile-related manufacturing jobs. With the growth of Charlotte to the west, farming has played a decreasing role in the economic life of the town. Increasingly, Midland has become a bedroom community for those commuting to work in nearby Charlotte and Concord. For many years, there were very few "outsiders" moving to Midland, but over the past two decades, many people with no familial roots in the area have settled there. New residents are attracted to the area for its lower taxes, less expensive housing and real estate prices, and a more rural flavor than that which is to be found in Charlotte or the surrounding larger communities. The Reed Gold Mine, site of the first discovery of gold in the United States, is located east of the town. The Reed Gold Mine is now a historic site under state management and is open to the public. Visitors to the mine can tour a museum with extensive information and displays on North Carolina gold mining, and can walk through several hundred feet of mine tunnels. The area was an important gold mining center in the 19th century; however, gold mining activity in the region predates the founding of Midland. The Bethel Church Arbor, John Bunyan Green Farm, and Robert Harvey Morrison Farm and Pioneer Mills Gold Mine are listed on the National Register of Historic Places. The climate in Midland is temperate, with chilly winters and hot summers. Thunderstorms are frequent in warmer weather. Severe weather occurs occasionally, and a few tornadoes have been recorded in Midland and its vicinity. Snow accumulations occur on occasion in the winter, and anywhere from zero to three significant accumulations of snow might reasonably be expected in an average winter. Accumulating snows generally melt away between snow events, and there is no consistent snowpack in winter. Pleasantly warm daytime temperatures may be experienced into November. Rainfall averages 40–45 inches (1,000–1,100 mm) per year. The town sits approximately 500–550 feet (150–170 m) above sea level. The land is gently rolling with no especially high points. The most common soil type is a red clay. The area is drained by the Rocky River, which is relatively small and generally shallow. Trees are abundant. There are no significant lakes in the town. Coordinates for Midland are 35°13′38″N 80°30′03″W﻿ / ﻿35.22722°N 80.50083°W﻿ / 35.22722; -80.50083. The town is located approximately 249 miles (401 km) northeast of Atlanta, 526 miles (847 km) southwest of New York City, 614 miles (988 km) southeast of Chicago, and 650 miles (1,050 km) north of Miami. From Midland, it is 2,423 miles (3,899 km) to the Equator and 3,792 miles (6,103 km) to the North Pole. US Highway 601 and NC 24/27 are the major highways. There are two traffic signals in the town - one at the intersection of Highway 601 and State Road 24/27, which is north of Midland proper and was once known locally as "Hell's Half Acre", and the other at the intersection of State Road 24/27 and Bethel Church Road. Via US 601 it is 15 miles (24 km) north to Concord and 18 miles (29 km) south to Monroe, while NC 24/27 leads east 19 miles (31 km) to Albemarle and west 21 miles (34 km) to the center of Charlotte. Midland has a very small downtown area along Kingsbury Drive. There are four buildings along the road in the area as well as parking spaces and a crosswalk. During the past two decades, Midland has become an industrial manufacturing hub within the Charlotte region. Corning operates a large-scale fiber-optic cable manufacturing plant in Midland that underwent a $50M expansion in 2012. Intertape Polymer Group announced in 2016 that they would build a $49M advanced manufacturing plant for the e-commerce sector north of the Corning plant. Transportation to Midland is limited to automobile traffic. The town is no longer served by passenger rail service, and there is no public general aviation airport within 15–20 miles (24–32 km). Commercial flights to the area are usually handled through the airport at Charlotte, approximately one hour's drive to the west. Charlotte Douglas International Airport has several hundred passenger flights per day with nonstop service to many locations in North America as well as service to Europe and the Caribbean basin. Some air passengers also use the new Concord Regional Airport, which has limited passenger air service, the Piedmont Triad airport at Greensboro, or at Raleigh/Durham, although these latter airports are two hours or more travel time by automobile. The closest seaports are located along the Atlantic Ocean approximately 165 miles (266 km) east of the town. Nearby recreation includes access to lakes, museums, professional sports, and extensive shopping in surrounding areas. The beaches of both Carolinas are popular vacation destinations. The Appalachian Mountains of North Carolina rise to the west and are also a popular vacation or day-trip destination. The cool, verdant heights of the Appalachian Mountains provide relief from the summer heat of the Piedmont and also winter recreation such as snow skiing. 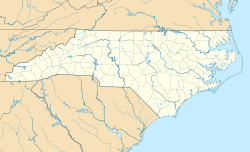 Mount Mitchell, the highest mountain in the eastern United States at a height of 6,684 feet (2,037 m), is 106 miles (171 km) west-northwest of Midland. ^ a b "2010 Demographic Profile". United States Census Bureau. Retrieved 10 January 2013. ^ "July 1, 2014 Estimates with July 1, 2014 Municipal Boundaries". U.S. Census Bureau, American Factfinder. Retrieved August 1, 2016. This page was last edited on 1 January 2019, at 21:17 (UTC).